This is a bewildering time for the whole world. So many groups and people want us to support their cause. They all want us to believe that they are truthful and have our best interests at heart. Yet, they are contradictory. How can it be right and profitable to follow each of them? It can’t; we must pick and choose the causes that speak to our souls. In November, the U.S. will vote for the successor to Barack Obama, who has already served two terms. We have two main political parties and three to five leading contenders from each party. The party members do not agree with each other, let alone with people from the other faction. They shout at each other, contradict and disrespect each other, and often act like children. Personally, I want to give a few of them “time outs” and/or send them to the principal’s office. I want to tell Donald Trump he's fired. How do we Discern the Truth? It’s left to the American public to sift the facts out from the furor of sniping and misdirection. How is that accomplished? 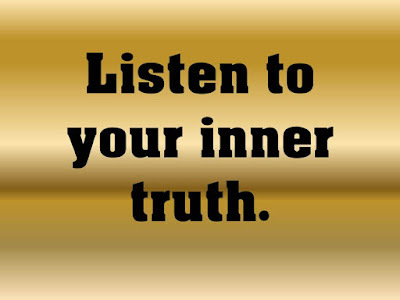 We have to look to our inner radar of truth; what we’ve been taught and what we believe. This is what individuals must use to steer their course. The Bismarck was an “unsinkable” German battleship during WWII. It was responsible for destroying Allied ships and lives. On the other hand, it had only sustained minimal damage during its eight-month career. On May 26, 1941, that all changed. A British aircraft carrier bombed the ship. The steering was disabled, which jammed the rudders into a turning position. All the Bismarck could do was turn around in circles. Not very useful. During the second part of the attack, the ship was shadowed and harassed by destroyers, but no serious damage was done. The last part of the two-day battle was a heavy 100-minute barrage of shellfire and torpedo hits. In the end, the ship was sunk (scuttled) by her own crew in order to save it from enemy hands. The Bismarck was only unsinkable as long as her steering mechanism was intact. Once her guide was disabled, she had no sense of direction. She could only sail in circles uselessly. She could no longer move away from any potential attack. She was vulnerable at last. From that point she was harassed, and then completely destroyed, by her enemies. The scriptures are our map. The promptings of the Holy Spirit are our compass. GPS receivers are similar to prayer. The counsel of leaders is our flashlight. Is your spiritual rudder intact?